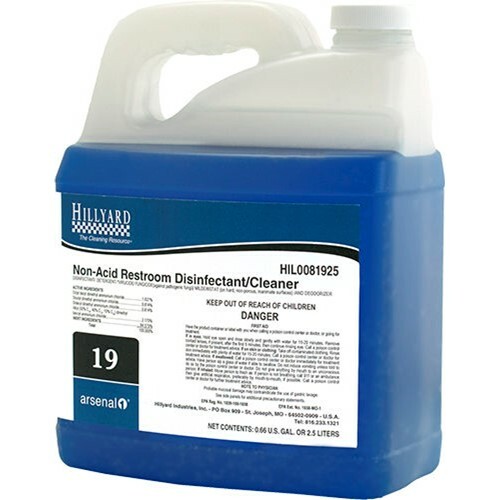 Home → Chemicals → Hillyard, Arsenal One, Non-Acid Restroom Disinfectant Cleaner #19, Dilution Control, HIL0081925, Four 2.5 liter bottles per case, sold as One 2.5 liter bottle. This product is a one step neutral disinfectant that is effective against a broad spectrum of bacteria, is virucidal (including HIV-1, HIV-2, HBV and HCV) and inhibits the growth of mold and mildew and their odors when used as directed. This product for use in: Hospitals, nursing homes, medical and dental offices and clinics, operating rooms, isolation wards, and medical research facilities, dressing rooms and laundries, crime scenes and funeral homes, institutional facilities, laboratories, factories, business and office buildings, restrooms, hotels and motels and transportation terminals, bathrooms, institutions, schools and colleges, churches, classrooms, athletic facilities and locker rooms, campgrounds, playgrounds, and recreational facilities, veterinary clinics, animal life science laboratories, kennels, breeding and grooming establishments, pet animal quarters, zoos, pet shops, and other animal care facilities, automotive garages, boats, ships, campers, trailers, health clubs, spas, tanning spas, massage/facial salons, hair/nail salons, barber/beauty shops, tattoo parlors. ACTIVE INGREDIENTS: Octyl decyl dimethyl ammonium chloride 1.627%, Dioctyl dimethyl ammonium chloride 0.814%, Didecyl dimethyl ammonium chloride 0.814%, Alkyl (50% C14, 40% C12, 10% C16) dimethyl benzyl ammonium chloride 2.170%, INERT INGREDIENTS 94.575% Dilution rate 2 oz per gallon.